The Tampa Bay Lightning are sending an NHL-leading dozen players to Toronto to compete in the 2016 World Cup of Hockey being held for the first time since 2004. The tournament’s exhibition schedule opened on Thursday, with games in Canada, Finland and Russia. Preliminary tournament games will begin on Sept. 17 and the finals are set to conclude by Oct. 1. In part one of this two-part preview of the Lightning’s World Cup participants, we took a closer look at the roles Steven Stamkos, Ben Bishop, Jonathan Drouin, Anton Stralman, Victor Hedman and Valtteri Filppula will each play on their respective World Cup teams. In part two, we preview the other six Lightning players participating in this eight-team international tournament: Team Russia’s Nikita Kucherov, Vladislav Namestnikov, Nikita Nesterov and Andrei Vasilevskiy, and Team Czech Republic’s Ondrej Palat and Andrej Sustr. Nikita Kucherov enters the World Cup where he will represent his country for the first time since the 2013 World Junior Championships. At the junior level, Kucherov has been dominant in international play, skating in 21 games and registering 18 goals and 18 assists. Kucherov, 23, will play for a Russian team that is loaded offensively. Kucherov joins Alexander Ovechkin, Vladimir Tarasenko and Evgeni Malkin as part of one of the tournament’s most talented groups of forwards. Kucherov enters the tournament as a restricted free agent and will put aside any contract concerns in the NHL to focus on helping his country to the World Cup. Kucherov got off to a good start by registering a goal in Russia’s 4-3 victory over the Czech Republic in exhibition play on Thursday. Vladislav Namestnikov is representing Russia in international play for the first time since the 2010 World Junior Championships. Namestnikov, 23, is a speedy forward who has shown grit and a scoring touch with the Lightning, but will play limited minutes for a Russian team that boasts no shortage of offensive firepower. In 12 games of international competition at the junior level, Namestnikov has tallied 12 goals and five assists. His performances at those tournaments and during his junior hockey career with the London Knights (OHL) are what helped the Lightning decide to select him 27th overall in the 2011 NHL Entry Draft, ahead of Kucherov, Nesterov and Palat. Nikita Nesterov was a late addition to Team Russia’s roster after the Russian Ice Hockey Federation accepted the NHL’s position that former Los Angeles Kings defenseman Slava Voynov would be ineligible for the tournament. 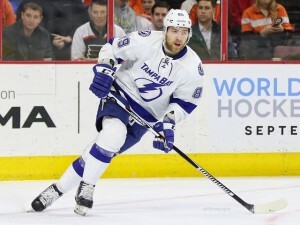 Like Kucherov, Nesterov enters the tournament as a restricted free agent for the Lightning. Nesterov, 23, also last skated for Russia on the international stage during the 2013 World Junior Championships. In 28 games at the junior level with Russia’s national teams, Nesterov has tallied six goals and 15 points and has added 66 penalty minutes. While Russia’s offense and goaltending are the team’s strong points, defense is considered to be the biggest question mark entering the tournament. Nesterov joins a defensive core that includes the Florida Panthers’ Dmitry Kulikov and the Montreal Canadiens’ Andrei Markov, and will bring a physical presence to the team’s blueline when he plays. Andrei Vasilevskiy joins Team Russia at the World Cup after an impressive performance with the Lightning during the 2016 Eastern Conference Final. 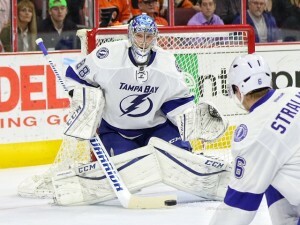 After goaltender Ben Bishop suffered a playoff-ending injury in Game 1 of the series, Vasilevskiy backstopped the Lightning to a seven-game series and helped cement himself as the team’s goaltender of the future. At just 22-years old, Vasilevskiy already boasts an impressive resume in international competition and most recently helped backstop Russia to a gold medal at the 2014 World Championships. While Vasilevskiy has played a bigger role in goal in tournaments of the past, he will likely not be playing a lot at the World Cup, barring injuries to the team’s other netminders. The Columbus Blue Jackets’ Sergei Bobrovsky and the Colorado Avalanche’s Semyon Varlamov figure to handle the bulk of the goaltending duties at the tournament. However, given Vasilevskiy’s performance during big games at the NHL level and in international play, he may get the nod if the team is struggling defensively during the World Cup. Ondrej Palat is part of a Czech team that has been riddled with injuries at it enters the tournament, the most noteworthy of which being forward David Krejci. The Czech’s injuries also mean that Palat will get the opportunity to serve a bigger role for the team at the World Cup. Palat, 25, was an effective player for the Czech Republic at the 2014 Winter Olympics. 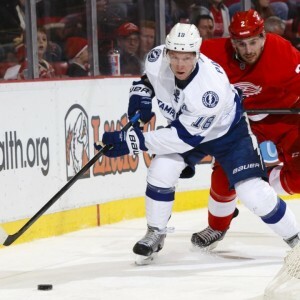 Despite the team’s sixth place finish, Palat tallied four goals in as many games. In 2015-16, Palat battled injuries and registered 40 points in 62 games after tallying 122 points in 156 games the past two seasons. While the Czech team is not a favorite to advance deep into the tournament, Palat has the opportunity to be a key player for the team given injuries to some of its other players. Andrej Sustr is competing for his country at the World Cup for the first time since the 2010 World Junior Championships. Sustr, 25, took major steps in his development as an NHL defenseman in the 2015-16 campaign. At 6’7″, 225 pounds, Sustr has begun to grow into his frame and looked more comfortable in his position than he had in seasons past. In 2015-16, Sustr set NHL career highs in games played (77), goals (4), assists (14) and points (21) as he played an increased role on the Lightning’s blueline. At the World Cup, Sustr will provide size on a Czech club as it faces some of the world’s best offensive talent.